Bringing new life to your jewelry collection is a lot easier than you think. Often times we choose to wear our favorite ring, engagement ring and pendant all the time, leaving some beautiful pieces stuck in a dark jewelry box. That’s no place for an heirloom diamond ring or an old gemstone pendant. Revive those pieces and make them something you show off to everyone. A special occasion is the perfect time to bring new life to a wedding ring. Create a more meaningful ring by adding two side diamonds to a solitaire setting symbolizing your past, present, and future as a couple. Years ago he picked out your wedding ring, mark that special anniversary by upgrading your diamond or have your existing diamond set in the ring you’ve always wanted! Adding color gemstones is another way to make that piece more unique and one you’ll want wear. You can choose a gemstone for its rich bold color or for the belief of what it will bring to the wearer. For centuries, Rubies have represented love and passion while blue Sapphires promise honesty and loyalty. There are so many gemstones to choose from; you’re sure to find the perfect one to bring new meaning to your vintage jewelry. Sometimes that vintage piece is too small or just not your style but that doesn’t mean you have to leave it in the jewelry box. 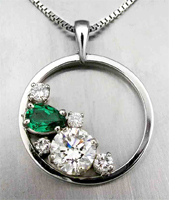 One of the best options is to have a custom piece of jewelry created specifically for you. Take the gemstones from your grandmother’s necklace and have them reset in a pendant that features the birthstones of your family members. That long strand of pearls you inherited can be converted into multiple bracelets, a layered choker or even an entire suite of earrings, ring, pendant and bracelet. We all have some pieces that we just no longer want but that doesn’t mean you can’t have the diamonds and gemstones reset into individual pieces that you can give to your children or grandchildren as a gift that they will cherish for years. 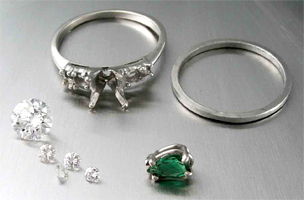 An easy way to enhance your jewelry is to have it professionally cleaned and inspected. We’re happy to do it for you, free of charge. Not only will we clean and buff your pieces, we also thoroughly inspect the gems and settings. Your pieces will look like brand new and your gems and diamonds will have that bright sparkle you’ve missed! In some cases you don’t need to do anything to revive your jewelry, you just need to wear them. Now is the time to mix and match metals and also styles, from vintage to modern. By doing this you can create a unique look. Everything from layering necklaces, bracelets or even rings can add contrast to any outfit. Once you start you’ll realize you have a lot of variety and you’ll start to love all your jewelry again. You really can’t go wrong unless you wear ALL of your jewelry at once– after all, we don’t want you to end up looking like Mr. T.
As Salvation Army volunteers in Holland tallied their red kettle donations on Wednesday, they discovered a golden surprise – one worth more than $1,100. Volunteers discovered a Canadian Maple Leaf gold coin – with a face value of $50 -- as they sifted through the kettle donations at its community center on Dec. 16. "I was shocked," Jeremy Monteith, Salvation Army's development director for Ottawa County, said on Friday, Dec 18. "You always hear about Salvation Army receiving gold coins, but I've been here for 10 years and this is the first time it's happened here." Salvation Army officials brought the Canadian coin to Holland Coin and Jewelry to have it appraised on Thursday. Chris Miner, owner of the coin shop, confirmed that the coin is 1-ounce of pure bullion (gold), and holds a retail value of $1,120. "It's a nice donation for them," he said. For years, anonymous donors have dropped gold coins in Salvation Army's red kettles across the country. The coins – some of which are accompanied by a note – generally reach over $1,000 in value. The coin plopped into the red kettle at the Family Fare grocery store location on Washington Street in Holland did not include a note. "We have no idea who gave it, but we are very thankful for it," Monteith said. "It just shows that people are very generous and trust the Salvation Army to use donations like that in the correct way." Monteith said they plan to sell the coin to a dealer and put that donation money toward the services they provide for those in need. Last year, the Salvation Army in Holland – which serves southern Ottawa County and all of Allegan County – had 11,000 individuals inquire about needing assistance, including food, clothing and rent and utility bills. They predict about the same amount this year, according to Monteith. The bells of Salvation Army's Red Kettle drive began ringing throughout the nation on Black Friday. Christmas Eve day is the final day for the 2015 holiday season donations. With more than 30 red kettle locations in the Holland area, all of the money raised at those sites will remain local, Monteith said. "It was just exciting to know that we get to be part of this and provide a lot of services to a lot of people," he said. The Royal Canadian Mint opened subscription ordering on two series for 2016 that should prove exceedingly popular because each features 99.99% pure silver coins that are sold at their legal tender face values. Included in the subscriptions are three unique $20 for $20 silver coins and two different $25 for $25 silver coins. All the coins will launch separately. The value to subscribers is the Mint’s guarantee of product availability and, it notes, price protection that includes no tax for Canadians and free ground shipping in Canada and the United States. In the past, both sets of coins have been warmly welcomed due to their innovative and varying designs and because of their affordability. According to the RCM, the $20 for $20 program will debut in January with a T-Rex silver coin. It will be followed in February by a Batman v Superman™ coin and then in May with a final coin whose design has yet to be announced. Designs for the two $25 coins are also yet to be unveiled but their releases will happen in June and October. Mintages for four of the five coins are unknown at this writing. 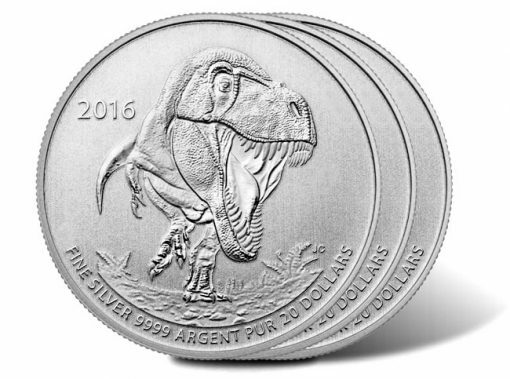 The 2016 $20 T-Rex Silver Coins is limited to 300,000. While they have different denominations, both series share major coin specifications that include per coin diameters of 27 mm, weights of 7.96 grams, specimen finishes, and serrated edges. Ordering information and additional details for both series are available on the Royal Canadian Mint website (mint.ca). An affiliate link to the Mint’s page of silver coins is found here. For subscribers, credit cards get billed only when each coin is shipped.